It's very nearly May Day. On May Day — May 1st — the French traditionally buy lily of the valley bouquets, and perfumistas traditionally wear lily of the valley perfume. Your options, of course, are many. There are the classics: Christian Dior Diorissimo, Caron Muguet du Bonheur (I checked, they're still making it), and Guerlain Muguet (they usually release a new version every year on May Day in Paris). There are the modern niche fragrances: Parfums Delrae Début, Van Cleef & Arpels Muguet Blanc, Parfums MDCI Un Coeur en Mai, and if you can get your hands on it, Annick Goutal's now discontinued Le Muguet. There are the chain-store standbys: Crabtree & Evelyn, Woods of Windsor, Yardley, Taylor of London and Caswell-Massey all make lily of the valley soliflores. And of course, there's the budget option: Coty's Muguet des Bois (I checked, they're still making that too and you can even buy it at Target). There are no doubt many others — please comment if you know of one I missed. Longwood Gardens' new fragrance, Always in Bloom, is likewise focused on lily of the valley, but it's hard to know where to categorize it on the list above: it can't compete with the modern niche scents — and happily it doesn't cost as much, either — but it's nicer than your average chain-store standby. Always in Bloom was released this spring in conjunction with the new Longwood exhibit, Making Scents: The Art and Passion of Fragrance, and it was developed by perfumer Olivier Polge. Polge said he wanted to capture a fresh, natural feeling with Always in Bloom, and that's just what he's done: this is an airy spring-like floral, very feminine, with mild green accents. The lily of the valley, as is often the case, is strongest in the opening; the dry down is more of a blended floral. The base is pale; vetiver and iris are listed in the notes, but it's more clean than earthy. Happily for me, it isn't so clean as to smell like air freshener. It isn't, admittedly, the sort of fragrance to excite perfumistas, and my interest in it is entirely provincial: I happen to live near Longwood Gardens. Still, it's quite pretty, and if you're after a more-pretty-than-interesting lily of the valley at a reasonable cost, it's worth a shot. Longwood Gardens Always in Bloom is available in 100 ml Eau de Parfum for $70, and can be found at the Longwood Gardens gift store. I don’t wear lily of the valley — it’s not quite “me” — but I do enjoy smelling it, which is why I covet this candle! I’ve sniffed it in person, and it’s lovely… but expensive. Oh, doesn’t that sound lovely!! I’d love to have one. But the description of Dominique Ropion as one of the “greatest connoisseurs of how white flowers evaporate” is odd, isn’t it? LOTV is one of my favorite notes so this sounds like something I might like. Thanks for the May Day reminder! I’ll use the last of my Diorissimo sample to celebrate! It is a shame there is no easy way for people to try it. It really is pretty. Can’t beat Diorissimo though. I was in Philadelphia recently and left the weekend BEFORE this exhibit started- I was so disappointed. This fragrance sounds like something that would be great to try, especially if I get a chance to visit the gardens in the meantime. Welcome spring! Oh, that’s too bad! But it’s there though November, so you’ve got plenty of time. Sounds worth a sniff if I get to Longwood in July. I really like Debut, but I’m not sure about the drydown. Coeur en Mai is probably even better, in my opinion — really lovely, and seems like there’s quite a bit more going on than LotV? No point of comparison for vintage Diorissimo, but I did NOT like the new one I tried once on a scent strip at Saks. Yeah, most of those, even or esp. Diorissimo, have a lot more going on than LOTV. I still have not gone to smell the new Diorissimo, and perhaps I’ll just ration my vintage EdT and skip it all together. The Longwood one is really nicely done — much better than what I would have expected to find in a garden gift store — but it cannot beat Coeur en Mai. Hello everyone! After months of following this blog, I finally have to make a comment: one of my favorite LOTVs is Comme des Garcons series 2 Leaves Lily. The longest name ever for a great, fresh and green perfume. Sadly discontinued. They are making it again! Dover Street Market in the UK has it. And where are my manners: I should have said welcome! Glad you you de-lurked. And just checked: Luckyscent says they’ll be shipping the CdG in early May. …. and look, there it is, on your list. I scanned right by it. Sorry! Calamus too! I wish they came in little 15 ml bottles, because they’re fun to layer and much as I love them, don’t need even 50 ml. Yes! Actually, if CdG did a humongous coffret with everything they make, all in 10 ml, I’d be mighty tempted no matter what it cost. Yes, what Robin said: WELCOME!! and thanks for bringing a new LotV scent to my attention—-I’m off to see what I can find out. Hi Foe! Thanks for mentioning this. I have a sample of the CdG Lily. I like it too; perhaps I’ll wear it May Day! Just wore Diorissimo on Sunday, so I think I will wear AG Le Muguet on Saturday, May Day! Hey you! I sadly cannot remember the AG although I know I tried it, and do like the rest in that floral series. Longwood Gardens! I grew up in Delaware and we used to go there all the time when I was a kid…it was even free back then, courtesy of the duPont family. I just came across some long-ago pix of grandmas and me at Longwood at Easter. Thanks, Robin! I live in Florida now and it’s already a little warm for LOTV…but it goes on May 1, regardless. And apparently then for a time they charged a dollar! Now, sadly, it is quite expensive: regular tickets are $16, but IMHO it’s worth it, and I can’t even imagine what it costs to run that whole place. My heart broke a few months ago when I read that they were hiring a new librarian/archivist for Longwood Gardens. If only the pay weren’t so low. What a dream job! I’ve always thought it would be great fun to work there, not least because everyone there always seems so happy. Oh, no kidding – what a joy to be around such beauty all the time! Thanks for the review – I am eager to hear about the success of this Longwood Gardens venture – the exhibit and the fragrance. It is good to have such a blockbuster event in PA. Perhaps they will do it again in subsequent years. I love the natural smell of LOTV – some ancient LOTV blooms every year near my apartment – but it does not work on my skin in fragrances. When I ever encounter LOTV dominant fragrances, I give them to my mother who adores it. Perhaps I’ll have to buy a bottle of this for her. Thanks for the tip! I have lots of LOTV in my garden, although it does not look like it’s going to cooperate and bloom by Saturday. I love the smell too. Thanks for the reminder. Lilies of all persuasions are special occasion scents for me (I wore Diorissimo to my wedding last year and will likely break it out for May Day as well…or maybe Debut…or the VCA….). Maybe I can get my Easter lilies to bloom again? I wish I had worn Diorissimo to my wedding! I was just wondering for those of us in the southern hemisphere, should we leave the LOTV perfume till 1st November and wear something warmer and spicier on 1st May? Just a thought! Oh, absolutely! And then I will be jealous of you on 11/1 when it’s too cold here to wear LOTV. I had no idea about the LOTV / May Day connection. Will have to break out my DelRae Debut on that day — sadly, the only one on your list that I have! Though I don’t wear the DelRaes often, Debut and Eau Illuminee are my favorites from her line. Debut is lovely, so nothing to be sad about! By the by, just remembered another LOTV — Ellie by Ellie D, which I don’t hear mentioned much these days. Also by Michel Roudnitska. Thanks to letting us know about LOTV day on May 1st. I didn’t know that. I won’t have big problem to pick perfume from my now huge collection (just in 1 year). I need to find sample of Ellie by Ellie D which is not bad at all. Lovely pics, thanks so much! And you got great shots of the vintage bottle collection. Ooh… I’ll have to pull out my Debut on Sunday. Does DK Gold count as a LotV? Or is it a different kind of lily? Maybe Stargazer? Once again, I answered my own question – DK Gold has Casablanca lilies, not LotV. Yeah, that one is real lily as opposed to lily of the valley. Great scent though! LOTV is a difficult note for me after a headache of magnificent proportions brought on by some essential oil in my youth. I did always like Diorissimo, though,and am so sad it is not the same any more (although I should probably smell it). I do have a smidge of Debut, and will give it a go on Saturday – thanks for the heads-up on the connection! Oh, don’t wear it if you think it will give you a headache! I have been successful with LOTV, I just have to be kinda picky. Too much mostly sparks a memory of the headache more than an actual headache. I’ve been kind of excited to learn that I really like lily of the valley. I really love VCA Muguet Blanc and I would buy it once the lotto money finally comes in. ;3 I hated Debut (I’ve got some on my ankle right now, actually) and I know how much you like it. I might give it a proper, full-on test on May Day. I would probably kill to try Diorissimo BR (I tried some new stuff on a tester and it smelled like paint thinner for longer than I could stand) but what I don’t know won’t depress me. This sounds nice but no samples. Paint thinner, ack! I suppose I should go try it, but probably won’t. I don’t know if Jessica McClintock is still in production, but that one’s a huge nod to LotV. PdN has a lesser-known LotV scent called Eclipse, although the flower note is most prominent in the opening and very fresh. On me, it turns herbaceous, and then celery becomes most prominent. OperaFan-The original Jessica McClintock is still in production-can be found online for a song….. To me, it’s deeper than Diorissimo, not as sharp and green and it lasts much longer on skin. Oh, I forgot Eclipse, thanks! Last summer I came across a small, vintage bottle of Diorissimo in what I suspect was extrait at a flea market on vacation. I made som serious bargains there and when I found that bottle I hadn’t got any cash left on me at all. I went back again for it the day after, but that particular stand was closed and I never did get hold of it in the end. Still irks me to this day! There is no muguet in my perfume wardrobe, or any other spring flowers for that matter, I clearly need to do something about that – I’m nursing a massive lemming for Le Temps d’Une Fête at the moment. Oh, the bottle that got away! What a shame. One of the few things I miss about France: seeing people selling small sprigs of lily of the valley on street corners on May Day. I adore the scent of LOTV, but I’m afraid I haven’t found a single one that is even close to it. There’s always something in there that spoils it. I just went to Longwood Gardens this past Saturday, and the fragrance exhibit is really excellent! I learned a few things (e.g. I never realized that patchouli is actually a plant, I think I thought it came from a root). 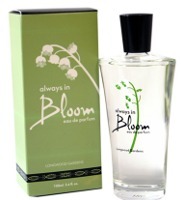 I also took a sniff of Always in Bloom–it wasn’t a must buy for me, but nicely done.